14 days completely free. Pay only for what you need. Understand your website with easy-to-use analytics. See what's happening right now with the world's most accurate real-time website analytics dashboard. Gain an instant overview of your website performance without any hassle. You don't need to set up multiple accounts to use GoSquared on all your projects. 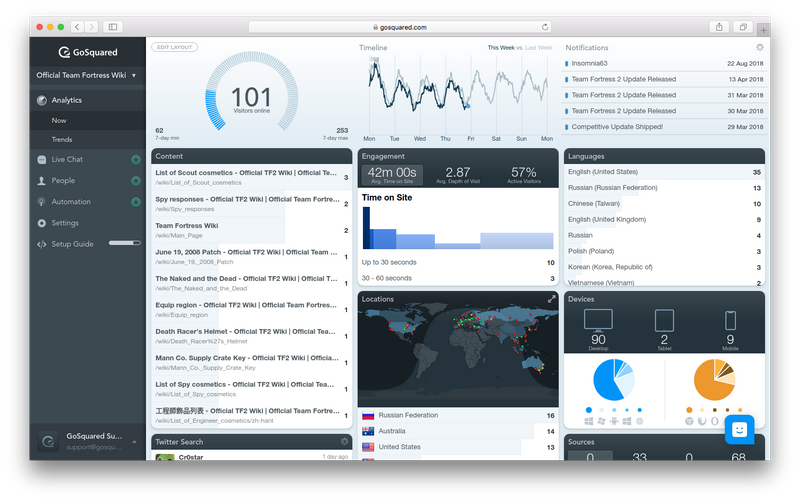 On all paid plans you can use GoSquared Analytics on as many websites as you need. Each website is totally separate – with its own team and settings. Grow your business with our suite of integrated products. The intelligent assistant for your website for lead capture, feedback, and live chat. Team Inbox with Live Chat. A shared team inbox on desktop, and for iOS and Android, to enable your team to message your visitors and customers. A central destination to send your user and customer data. Every pageview, every event, and every conversation in a searchable place your whole team can access. Automatically engage with leads and customers based on behavioural data via personalised in-app messages. Our complete enterprise platform, with dedicated training and customer success. Pay only for what you need. You can upgrade or downgrade at any time. Every website or app you want to use GoSquared on can be added as a separate project in GoSquared – all managed under one account. You can invite as many colleagues as you like to your account. GoSquared is better when you use it with your team. Respond to visitors, leads, and customers on the go with GoSquared Inbox for iOS and Android. How does GoSquared's pricing work? When you create a GoSquared account, you're automatically placed on an unlimited, fully-featured 14 day free trial. At the end of your trial, you can choose to use GoSquared Analytics from £29 / month, the full GoSquared Suite from £79 / month, or use the free tier of GoSquared Analytics. Your price will depend on what features you want to use, and your usage volume. We offer GoSquared Enterprise for larger businesses who require more assistance with setup, training, and roll out. Each website or app you want to use GoSquared on can be added as a separate project in GoSquared – all managed under one account. Each project can have its own team and settings and is totally isolated from your other projects. What's the difference between GoSquared and GoSquared Enterprise? Large businesses typically have much higher traffic volumes and have different needs to smaller businesses. GoSquared Enterprise gives large businesses custom tools and the dedicated assistance needed to scale up to high traffic volumes. Is there any limit to the number of team-mates I can add? No, you can add as many team-mates/agents/seats as you need. We want your whole team to benefit from using GoSquared. Will I be charged automatically at the end of my trial? No. There's no need to enter your credit card up front, so you're in control. At the end of your trial, you choose whether to upgrade your GoSquared account, and you can cancel any time. The actual price of your subscription will vary depending on your billing cycle (annual vs monthly), and the tax payable in whatever region you're based. The prices shown are exclusive of tax such as VAT.